Thank you for your interest in the Family Tuition Plan. The FTP strives to make it possible for every interested family to educate their children in Scott County Catholic schools regardless of financial barriers. While elementary tuition for one child is within the reach of most families, many families struggle to pay full tuition at times when they have two or three elementary students and/or one or more students at Assumption High School. Parents sometimes forego a Catholic education for their children after analyzing family budgets and fearing it may become difficult to manage tuition during peak years. The FTP is designed to assist families at times when tuition costs are high in relationship to total family income. The graph at right demonstrates how the FTP benefits families at times of peak tuition. The dotted line illustrates the family portion of tuition for a family of five earning $63,000 per year. Of course this is only one example - each family that is evaluated on the FTP has their own "dotted line" at some level of tuition. Our Catholic schools offer outstanding academic and faith development programs, so we are especially excited about the FTP, a program funded through the Embracing Our Future campaign. 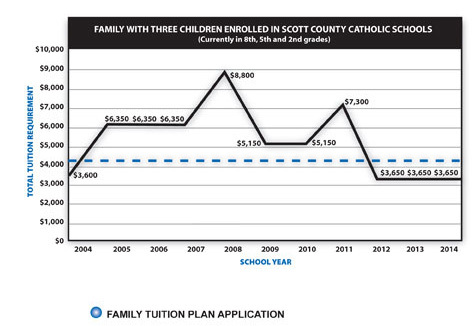 Families that feel challenged to enroll or keep their children in Scott County Catholic schools are encouraged to fill out a Family Tuition Plan application. All financial information is held in strict confidence. Completed forms may be returned to P.O. Box 1597, Davenport, IA 52809-1597.